James Cameron from “Titanic 1997” Academy Award winning fame (11 Oscars®) has given us undoubtedly another incredible film. 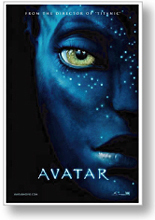 “Avatar” written and directed by Cameron is a visual 3D IMAX experience that will leave you spell bound! He’s created an alien world on the planet Pandora which is magical and mysterious. The lush rain forest, roaring waterfalls and exotic colorful animals are all eye-popping treats. The climate is awesome and so are the aliens; blue in color with large eyes, 12ft. tall slender agile bodies and magical tails. They speak Na’vi their own language and can understand ours. They are a peaceful and put into practice the idea of symbiosis, (living in close association with plants and animals cooperatively forming a beneficial relationship amongst each other). Yes, the aliens are cool, very cool! How did he create such fascinating looking aliens? It’s the same motion capture digital technology that was used in the films “Beowulf,” “The Polar Express” and “Disney’s A Christmas Carol.” The production notes for “Avatar” have renamed this process ‘performance capture.’ After all, Neytiri (Zoe Saldana) an alien who is the love interest in the story had extensive training in martial arts, archery and bare back horse riding. Basically the actors still need to act; they simply skip the 5 hour make-up sessions that were required in “Star Wars” to achieve their alien appearance. The sci fi tale begins as Jake Sully (Sam Worthington) narrates the ‘low down’ on what’s happening in the year 2154. Earthlings have exhausted most of the resources and are extremely interested in the planet Pandora as it contains a resource that is very valuable. Jake is an ex marine and is in a wheel chair as he doesn’t have the money to fix his spine. He’s called for a mission on Pandora where his brother worked as a scientist who is now deceased. Jake has similar DNA to his brother and could be used to further the experiments on Pandora. The creative part of the story is that an ‘Avatar’ can be generated that looks like the Na’vi aliens but thinks like a human when the human is in the activation chamber. Grace (Sigourney Weaver) is a scientist on Pandora who has been living amongst the tribe as her Avatar studies the cultures’ ways. She’s become very fond of the natives and is very protective of them. She’s fabulous in this strong female role and is delightful to view as her character and an Avatar. Jake is given instructions by Col. Quaritch (Stephen Lang) a hardnosed commanding officer who has no regard for the aliens on Pandora to get into their heads and find out where their weaknesses are. Learn their habits and gain their trust are the orders. Jake listens intently but is eager to begin his journey as a native. When Jake ‘tests’ out his Avatar for the first time the scene is incredible! He meets Neytiri and she soon helps him out in the strange and exotic land. To condense the 2 ½ hour film here’s what happens in a nutshell without giving too much away. Jake goes native and falls for Neytiri, he meets her parents and it’s up to him to try and save the tribe (who fight with bows and arrows) against the big bad army guys with the high powered techno weapons. There’s a ‘big battle’ and it’s violent so parents don’t bring anyone under the age13. The language is mature as well. All and all a creative masterpiece of a film and I can’t wait to see it again.